A 4-1 win in Asuncion had put Peru back into the qualifying picture this week, so they had every reason to go for the jugular against high flying Brazil. Tite will have wanted for his team to be tested in the intense Peruvian atmosphere and for the first 15 minutes or so especially, he was not disappointed. Peru pressed and harangued the Seleção high up the pitch, disrupting their rhythm as they tried to pass out from the back. Peru’s Andre Carillo hit the base of the post from close range inside the first ten minutes. It was the closest Brazil had come to falling behind during a game in Tite’s tenure. It would have been interesting to assess their reaction had they surrendered an early goal. Peru’s defence took their cue from Cueva and Guerrero and sought to squeeze the space for Brazil’s attack. Time and again, Neymar was hounded back towards the halfway line with the ball in his possession, while Coutinho continually ran into traffic as he looked to wander in field. Captain for the evening Fernandinho nearly scored with a header from a set piece, but Brazil struggled to open up a resolute Peru defence. The pattern held early in the second half, but two crucial factors proved to be the home side’s undoing. Fatigue was part of it, having roared back from a goal down against Paraguay on Thursday, Peru struggled to maintain their intensity, especially as the turf in Lima appeared heavy, with chunks of turf cutting up beneath the players’ feet. Peru’s players are not as accustomed to playing with that sort of intensity twice in a short timespan as Brazil are. But one of the reasons that Tite is yet to see his team operate in adversity is because his in game management has been close to perfect. In this match, he asked Renato Augusto and Paulinho to switch sides. Augusto normally plugs the gaps for Neymar on the left and acts as a supply line for the Barca striker. With so much focus on Neymar from the home side, all of the space was on the right side of the pitch. Renato Augusto moved over to the right to evade the concentration of red and white shirts and orchestrate play. This in turn, helped Coutinho to influence the game. Both of Brazil’s goals were a direct consequence of this tweak. For the first, Coutinho has smuggled his way into the penalty area after an hour or so of having been shepherded away from danger areas. As Coutinho makes his way into the area, Brazil benefit from some felicity. The ball ricochets off of the leg of a Peruvian defender and straight into the path of Gabriel Jesús. The 19 year old demonstrated an eerie level of composure, steadying himself and nonchalantly stroking the ball into the net, well away from the keeper’s despairing dive. Tite has been fortunate in one respect in that he has been able to benefit from the Seleção’s first top class number 9 in a decade. 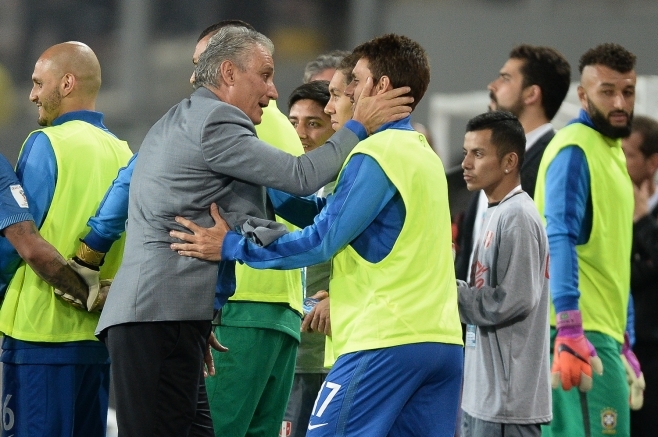 It’s solved a huge issue that hung over his predecessors Dunga, Mano Menezes and Felipão. The second goal saw Gabriel Jesús again illustrate his maturity. Most 19 year olds with 5 goals in 6 games for their country would shoot on sight in the area. But Jesús had the presence of mind to look up and shift the ball to Renato Augusto on the right hand side of the area. He steadied himself and arrowed a low shot into the bottom corner. The Beijing Guoan midfielder is a huge factor in Tite’s success, providing a kind of tactical polyfilla for the wandering Neymar and Coutinho. His ball distribution is beyond reproach. He is the brains of this outfit. Brazil have been tested in many different ways during Tite’s short reign, but they have always been able to find an answer thanks to the coach’s smart game management. The Seleção have also been very clinical with their chances, converting periods of dominance into goals. Peru can be satisfied with their performance, they did very little wrong and made few errors. Brazil just maintained their focus, waited for their chance and took it when it arose. In other words, they made their individual quality count due to the cohesion of the collective. Brazil now sit four points clear at the top of the CONMEBOL table with World Cup qualification all but guaranteed. The good news kept rolling in as well, Luis Suarez’s booking during Uruguay’s 3-1 defeat in Santiago means that he is suspended for the qualifier between Uruguay and Brazil in Montevideo in March. Tite is applying the Midas touch to this Brazil squad, but he will still want to see what they are made of when some of the finish rubs off. BRAZIL; 1.ALISSON, 2.DANI ALVES, 3.MIRANDA, 13.MARQUINHOS, 6.FILIPE LUIS, 5.FERNANDINHO (c), 8.RENATO AUGUSTO, 15.PAULINHO, 11.PHILIPPE COUTINHO (7.Douglas Costa ’86), 10.NEYMAR, 9.G.JESUS (19.Willian ’82).